An article that appeared in the New Straits Times provides a pretty accurate and impartial summary of the current political situation in Thailand and what has led to it. It is consistent with several points I made the other that were raised at the Foreign Correspondents’ Club’s panel discussion. Thailand’s poor have decided that docility is a thing of the past. They are angry and frustrated by the status quo and are clamouring for change. In other prosperous democracies, the middle class provides the glue that holds society together. 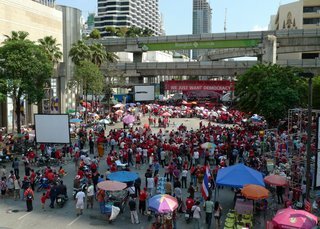 In Thailand, by contrast, the bourgeoisie, centred in Bangkok, is barely emerging as a social and political force. This entry was posted in Uncategorized and tagged politics, Protests, Thailand by christao408. Bookmark the permalink. Very enlightening. Thanks for sharing! By the way, take care that you don’t come too close to the crowd. Thank you for sharing, Chris. Just make sure not to stand to close to the crowd while taking photos, alright?I think the situation will get worse before getting better. Not a good idea to wear any colour tees nowadays in the Big Mango, particularly bold colours, I suppose? Thank you – that was a good insight. @CurryPuffy – Now the Red Shirts are specifically not wearing red so they can get through police checkpoints into the protest area. @ElusiveWords – You’re welcome. @choyshinglin – Yeah, I learned my lesson on Thursday night when I missed the grenades by only an hour. No need for me to risk anything; I can borrow pictures from the internet if I need to illustrate. @Redlegsix – Well, my mom didn’t say anything when we spoke on the phone this weekend. Probably biting her tongue!